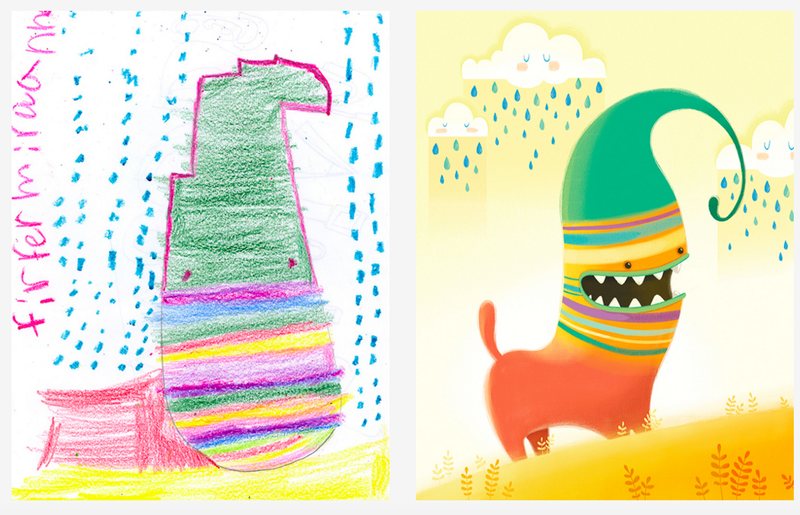 The Monster Project wants to teach kids about creativity by connecting them with professional artists. The idea behind the Kickstarter campaign is to help children learn that their imaginations are something to be cherished and may even lead to a career – although some of the below drawings raise more questions than answers IMO. The creators of the project ask elementary school children to submit a drawing of a monster or figure and an artist re-interprets it to make a new version. The original creator then receives a copy of the artist’s impression. It’s a compelling example of how their imagination and creativity can grow into something new. The project is attempting to raise $20,000 to help connect more schools and pay for printing costs. Pledges start from $5 to receive artwork from artists direct to your inbox and stretch all the way to $1,000 to become an official sponsor of the project and help expand it to new cities. In the UK, the cuts to arts and cultural programmes in schools have been severe. In America, too, there have been numerous campaigns to halt the erosion of opportunities for kids to embrace their creative side. In one particularly moving video, George Lucas, actor John Lithgow and a host of others explain why the humanities are so important to helping us understand what it means to be alive today. If the Monster Project helps one child believe they can have a career based on what their imagination comes up with, it’ll be a small, but significant victory.